Mandela - The "Great Statesman"
"Nelson Mandela is a symbol, an icon, one of the world's most famous statesmen, recognised and revered by all. He dines with royalty, associates with the world's great leaders and his opinion is sought and valued on all weighty matters. He has achieved an almost divine status in the world, equal to that of the Pope or the late Princess Diana." Most people on the left of the political spectrum would agree wholeheartedly with the above quote. But they run into an unexpected problem when someone asks "why is he considered such a great statesman?" The problem is that Mandela, apart from having a likeable personality, has achieved next to nothing in his relatively short political career which saw South Africa rapidly decline to the status of the world's most violent and crime-ridden country, and, to add to the confusion, his greatest friends are communists and dictators like Fidel Castro, Moammar Qaddafi, Yasser Arafat and Saddam Hussein. His ex-wife Winnie Mandela, whom he quickly jettisoned when it became clear she was a considerable embarassment to his political career, is a self-confessed advocate of terrorism and violence and has even committed murder. There's one thing where that country stands out head and shoulders above the rest. That is in its love for human rights and liberty. Committment to the fight for peace and human rights in the world. We support the cause of anyone who is fighting for self-determination, and our attitude is the same, no matter who it is. I would be honored to sit on the platform with the four comrades you refer to. 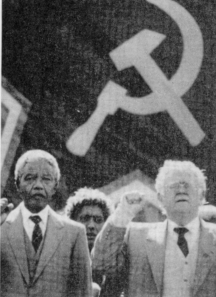 It is also interesting to note that in later years Mandela was offered his freedom by none other than the South African President Botha if he would simply renounce the use of terrorism, but Mandela refused to do this. The Soviet Union is the torch-bearer for all our hopes and aspirations. We have learned and are continuing to learn resilience and bravery from the Soviet people, who are an example to us in our struggle for freedom, a model of loyalty to internationalist duty. In Soviet Russia, genuine power of the people has been transformed from dreams into reality. The land of the Soviets is the genuine friend and ally of all peoples fighting against the dark forces of world reaction. With our boxes of matches and our necklaces we shall liberate this country. referring here to her own specific brand of democratic political activity whereby anyone who opposed her would be bound hand and foot and then burned to death by means of a tyre filled with gasoline being placed around the neck and set on fire. Has Mandela since changed his tune in any way? You will come to the conclusion that the attitude of the United States of America is a threat to world peace…. It (war against Iraq) is clearly a decision that is motivated by George W. Bush’s desire to please the arms and oil industries in the United States of America…When there were white (UN) secretary generals you didn’t find this question of the United States and Britain going out of the United Nations. But now that you’ve had black secretary generals like Boutros Boutros Ghali, like Kofi Annan, they do not respect the United Nations. They have contempt for it… It is the men around him (Cheney and Rumsfeld) who are dinosaurs, who do not want him (President Bush) to belong to the modern age… The only man, the only person who wants to help Bush move to the modern era is Gen. Colin Powell. "if there is a country that has committed unspeakable atrocities in the world, it is the United States of America...Iraq produces 64 percent of the oil in the world. What Bush wants is to get hold of that oil." Apart from displaying his Communist sentiments, Mandela here also reveals his ignorance of world economics - Iraq produces only 5% of world oil exports, not 64%. He also makes no mention of the huge debts of money that Iraq owes France, Germany and Russia, and that it is just possible that they are opposed to the war because they would like those debts paid. The goal of Communism is a classless society based on the principle: from each according to his ability and to each according to his needs. The aim is to change the present world into a Communist world where there will be no exploiters and no exploited, no oppressor and oppressed, no rich and no poor. Communists fight for a world where there will be no unemployment, no poverty and starvation, disease and ignorance. In such a world there will be no capitalists, no imperialists, no fascists. There will be neither colonies nor wars. Under a Communist Party Government South Africa will become a land of milk and honey. Political, economic and social rights will cease to be enjoyed by Whites only. They will be shared equally by Whites and Non-Whites. There will be enough land and houses for all. There will be no unemployment, starvation and disease. Workers will earn decent wages; transport will be cheap and education free. There will be no pass laws, no influx control, no Police raids for passes and poll tax, and Africans, Europeans, Coloureds and Indians will live in racial peace and perfect equality. The victory of Socialism in the U.S.S.R., in the Peoples Republic of China, in Bulgaria, Czechoslovakia, Hungary, Poland and Rumania, where the living conditions of the people were in many respects similar and even worse than ours, proves that we too can achieve this important goal. Communists everywhere fight to destroy capitalist society and to replace it with Socialism, where the masses of the common people, irrespective of race or colour, will live in complete equality, freedom and happiness. They seek to revolutionise society and are thus called revolutionaries. Those who support capitalism with its class divisions and other evils and who oppose our just struggles to end oppression are called counter revolutionaries. we Communist Party members are the most advanced revolutionaries in modern history and are the contemporary fighting and driving force in changing society and the world. Revolutionaries exist because counter-revolutionaries still exist. Therefore, to conduct a ceaseless struggle against the counter-revolutionaries constitutes an essential condition for the existence and development of revolutionaries. If they fail to carry on such a struggle, they cannot be called revolutionaries and still less can they advance and develop. It is in the course of this … [that] ... members change society, change the world and at the same time change themselves. To succeed in conducting a ceaseless struggle against the counter-revolutionaries, and to be able to play the vital role of being the most advanced revolutionary and driving force in changing society and the world, one must put all else aside and seriously and faithfully undertake self-cultivation. (b) the cultivation of one’s ideas. (a) ONE’S STEELING IN THE PRACTICAL STRUGGLES OF THE OPPRESSED PEOPLE. To become the most advanced communist revolutionary, it is not enough to understand and accept the theory of Marxism-Leninism. In addition, one must take part in the practical struggles of the people against oppression and exploitation. A person who is isolated from the people’s struggles, an arm-chair politician however deep his knowledge of Marxist theory might be, is not a communist revolutionary. It is only in the course of such practical struggles that one’s advancement and development is stimulated, that one acquires the necessary experience to guide the masses of the people in their political battles and the art and skill of being a driving force in changing society and the world. It is precisely for this reason that SACP requires its members to participate fully and without reservations in such issues as the Anti-Pass Campaigns, the struggle against Bantu Authorities, against job reservation, the Group Areas Act and in all other mass campaigns. By consistently taking part in such struggles, Party members who may ……… whatsoever, gain valuable knowledge and get hardened for the stern mass struggles that are part and parcel of the life of every Communist revolutionary. Participation (in) practical mass struggles does (not) in itself enable a Party member to raise his revolutionary qualities, nor does it help him to understand the (aims) of the development of society and the laws of the revolution. Progress in one’s revolutionary qualities and knowledge of the laws of social development and the laws of the revolution will be achieved by a thorough understanding of the meaning of Marxism. It is thus absolutely imperative for all Party members to have to make a serious study of Marxist philosophy and to master it completely. Only in this way will Party members become the most advanced revolutionaries. Only in this way will they advance and develop. The aim of studying Marxist philosophy is to enable us to direct more effectively revolutionary mass struggles. To put it in a nutshell, Marxism is a guide to action. Communist Party members must undertake self-cultivation whether they are new members in the Party or old ones, whether they are workers, peasants, businessmen, professional men or intellectuals, and whether they are conducting difficult or easy revolutionary mass campaigns; in victory or defeat. Finally, self-cultivation must be imaginative and practical, and must be used to eliminate from one’s outlook and conduct unhealthy tendencies which local conditions may give rise to. South Africa is a country where the Whites dominate politically, economically and socially and where Africans, Coloureds and Indians are treated as inferiors. It is a country torn asunder by racial strife and where black and white chauvinism finds fertile soil in which it thrives and where efforts and appeals for working-class solidarity very often fall on deaf ears. The pamphlet compiled by the S.A.C.P. to mark the fortieth anniversary of the Communist Party of South Africa which preceded the S.A.C.P. and which was declared illegal in 1950 correctly points out that, in spite of all the formidable difficulties that face it, the C.P.S.A. had in its existence brought about profound changes in the thinking and political outlook of the oppressed people of South Africa. These achievements are being expanded and further developed by the S.A.C.P. ; the worthy successor of the C.P.S.A. In spite of these advances, however, there is still the danger that the historical problems and prejudices produced by capitalist society in our country may infiltrate into our Party and influence the political outlook of our Party members. In cultivating their outlook, our members must consciously strive to remove these particular weaknesses and shortcomings as well. 2. HOW TO BECOME THE BEST PUPILS OF MARX, ENGELS, LENIN AND STALIN. At the beginning of these lectures, we defined a communist as a member of the Communist Party who understands and accepts the theory and practice of Marxism, Leninism as explained by Marx, Engels, Lenin and Stalin. Any person may become a member of the Communist Party if he accepts the Programme and Constitution of the Party, pays Party membership fees and undertakes tasks given to him in one of the Party’s organisations. These are called the minimum qualifications that every Party member must possess, but every one of our members should not be content to be a member of minimum qualifications He must strive to become a member of maximum qualifications. Every Party member should raise his revolutionary qualities in every respect to the same level as those of Marx, Engels, Lenin and Stalin. Some say that it is impossible to acquire the great qualities of revolutionary geniuses like Marx, Engels, Lenin and Stalin and that it is impossible to raise our own qualities to the same level as theirs. But as long as Party members work hard and earnestly, never allow themselves to be isolated for one single moment from the day to day struggle of the people, and make serious efforts to study Marxist literature, learn from the experiences of other comrades and the masses of the people, and constantly strive to steel and cultivate themselves, they will be perfectly able to raise their qualities to the same level as that of Marx, Engels, Lenin and Stalin. There are two ways of studying Marxism. One is to learn it by heart and be able to repeat mechanically the information learnt without being able to use this information for the purpose of solving problems. The second is to try to master the essence, spirit and methods of Marxism. In this second category belongs those comrades who read over and over again Marxist literature, who pay special attention to the concrete conditions existing in the country where they live and draw their own conclusions, their …… activities, their attitude towards other comrades and the masses of the people, and the whole of their lives are guided by the principles of Marxism-Leninism and aimed at one thing - national liberation, the victory of the working class, the liberation of mankind, the success of Communism and nothing else. To reach this goal calls for a supreme effort and an iron will. It means complete dedication to the struggle for the removal of oppression and exploitation and for lifelong dedication to the study of Marxism. Cultivation must be carried out in all aspects in the course of the long and strenuous struggle to free the working class and the masses of the people from capitalist exploitation. Cultivation is needed in studying Marxism and in applying it to answer questions and to solve practical problems, in sharpening one’s class outlook and political thinking, in shaping one’s moral character and behaviour; in hard work and ability to withstand hardship, in preserving the unity of the Party and conducting inner party struggle; in loyalty to the Party and complete dedication to the cause of the Communist Revolution. The life of a Communist revolutionary is no bed of roses. It consists of serious studies in Marxist literature, of hard work and of constant participation in numerous and endless mass struggles. He has no time for worldly pleasures and his whole life is devoted to one thing, and one thing only, the destruction of capitalist society, the removal of all forms of exploitation and the liberation of mankind. A Communist revolutionary always combines thought with practice. He studies for the sole purpose of putting into practice what he has learnt. He regards Marxism, as ….. action and takes part fully and without reservation in mass struggles directed by the party or by other political organisation outside of the Party. In South Africa, a Communist Party member must take part in mass struggles initiated by the S.A.C.P., the Congress movement or by other political bodies within the liberation movement. 4. RELATION BETWEEN THE STUDY OF MARXIST-LENINIST THEORY AND THE IDEOLOGICAL CULTIVATION OF PARTY MEMBERS. We do need Communist Party members who are highly intelligent and who have ability and who make it their business to have a thorough understanding of Marxist theory. But a working class revolution will be carried out successfully by those Party members who, in addition to the characteristics mentioned above, adopt without reservation, the standpoint and ideals of the working class. Although they may be unable to recite quotations from Marxist textbooks, experience shows that Party members of working class origin have a keener interest and deeper understanding of Marxism-Leninism than those Party members of student origin provided it is explained to them in words they understand. In loyalty to the Party, in discipline and in the handling of practical problems, they often prove more correct and more in conformity with the Principles of Marxism-Leninism than others. This is so because Party members of working class origin have a firm and pure Communist standpoint and ideals, an objective attitude towards things, and in their minds they have no preconceived ideas whatsoever, and no worries about personal problems or about impure matters. Party members who lack a firm working class outlook, who have the habits and ….. of other classes and who have personal interests and selfish ideas are not true Communists. As a matter of fact they very often find that Marxist-Leninism principles will clash with their interests, and they invariably try to distort these principles to suit their own personal interests and prejudices. Every Communist revolutionary must therefore, firmly adopt the standpoint and ideology of the working class. Unless he does this, it is not possible for him to understand the universal truth of Marxism-Leninism. 5. THE CAUSE OF COMMUNISM IS THE GREATEST AND MOST ARDUOUS CAUSE IN THE HISTORY OF MANKIND. On Page One of this section we found out that our aim is to change the present world into a Communist world where there will be no exploiters and exploited, no oppressor and oppressed, no rich and poor. We also make the point that the victory of Socialism in the U.S.S.R., in China and other States in Asia and Eastern Europe proves that a Communist world is capable of attainment. Moreover, since the victory of Socialism in the U.S.S.R. in 1917, the Socialist camp has grown to become a world force with a population of more than 1,000 million and occupying a third of the globe. But in spite of this victorious advance, the Communist movement still faces powerful enemies which must be crushed and wiped out from the face of the earth before a Communist world can be realised. Without a hard and bitter and long struggle against capitalism and exploitation, there can be no Communist world. The cause of Communism is the greatest cause in the history of mankind, because it seeks to remove from society all forms of oppression and exploitation to liberate mankind, and to ensure peace and prosperity to all. A Communist revolution is different from all other revolutions in history. Whereas in other revolutions the seizure of State Power is an end in itself, in a Communist revolution the seizure of State Power by the working class is a means to an end, that end being the total removal of all forms of exploitation, the liberation of mankind by building up a classless society. Every Communist Party member must possess the greatest courage and revolutionary determination and must be prepared to play his part and carry out all political tasks without fear or hesitation. In the struggle to transform the present world into a Communist world, we must strive consistently to combine theory with practice. Finally, WE must live and develop in reality in fighting to change the world, we must start from the very people in close contact with us. We must thoroughly study our own situation and problems, understand them completely and work out appropriate solutions. 6. THE UNCONDITIONAL SUBORDINATION OF THE PERSONAL INTERESTS OF A PARTY MEMBER TO THE INTERESTS OF THE PARTY. A Communist Party member must subordinate his personal interests to those of the Party. The Communist Party has no interests of its own apart from those of the working class. Therefore, the subordination of a Party member’s personal interests to the Party’s interests means subordination to the interests of the working class. We test a Communist Party member’s loyalty to the Party, to the revolution and the Communist cause by the manner in which he absolutely and unconditionally subordinates his interests to those of the Party under all circumstances. To sacrifice one’s personal interests and even one’s life without hesitation for the cause of the Party is the highest manifestation of Communist ethics. In the Party our members should not have personal aims independent of the Party’s interests. The desire for personal power and positions, individual heroism, conflict with the interests of the Party and the working class. (i) He must posses very good Communist ethics. He can show love and loyalty to all his Comrades, revolutionaries and working people, help them unconditionally, treat them with equality and never harm any one of them. He always tries to do more revolutionary work than others and to fight harder. In times of adversity he will stand out courageously and unflinchingly and, in the face of difficulties he will demonstrate the greatest sense of responsibility. He is able to resist corruption by riches or honours, to resist tendencies to vacillate in spite of poverty and lowly states and to refuse to yield in spite of threats of force. (ii) He possess(es) the greatest courage. He can see his mistakes and shortcomings and has sufficient willpower to correct them. At all times and under all circumstances he speaks the truth and nothing but the truth. He courageously fights for it even when it is temporarily to his disadvantage to do so. (iii) He has a thorough understanding of the theory and method of Marxism-Leninism. He has an objective attitude. (iv) He is the most sincere, most candid and happiest of men. Apart from the interests of the Party and of the revolution he has no personal losses or gains or other things to worry about. He takes care not to do wrong things when he works independently and without supervision and when there is ample opportunity for him to do all kinds of wrong things. He does not fear criticism from others and he can courageously and sincerely criticise others. (v) He possesses the highest self-respect and self-esteem. For the interest of the party and of the revolution, he can also be the most lenient, most tolerant and most ready to compromise and he will even endure if necessary, various forms of humiliation and injustice without feeling hurt or bearing grudges. The Communist Party represents not only the interests of individual Party members but also the long-range interests of the entire body of workers and the emancipation of mankind; the Communist Party has no other interests and aims. The Party must not be regarded as a narrow small group like a guild which seeks only the personal interests of its members. Whoever holds such a view is not a Communist. A member of our Party is no longer just an ordinary person. He is a conscious vanguard fighter of the working class. He should prove himself a conscious living representative of the interests and ideology of the working class. He should thoroughly merge his personal interests and aims in the general interests and aims of the Party and the working class. A communist revolutionary has his personal interests and the Party should neither eliminate his personality nor prevent personal development, as long as these do not conflict with the interests of the Party. This is what is meant by the unconditional subordination of the personal interest of a Party member to the interests of the Party. 7. EXAMPLES AND ORIGIN OF THE VARIOUS KINDS OF ERRONEOUS IDEOLOGIES IN THE PARTY. (i) People who join the Communist Party come from different classes of society and bring with them various habits which often clash with the basic tenets of Marxism-Leninism. Because these people do not have a firm and clear cut Communist outlook they very often waver and even desert the Party when they are faced with danger or difficulties. The Party must pay particular attention to the education, steeling and self-cultivation of such comrades since without them, they cannot develop to be true Communists. No Communist Party anywhere in the world limits its membership only to those who have a thorough understanding of Communism. The Party will admit any person who accepts the programme of the Party and its Constitution. By serious study and hard work such comrades can develop into excellent Communists ready to give their lives for the Party and the Communist cause …. individualism and self interests in their work. In their attitude and work they place their personal interests above the Party’s interests, they worry about personal gains, they use the Party for their own personal interests. They always want special treatment, less work and more pay. They avoid hard work and hardship; and will disappear at the first signs of danger, and yet they will want to share the honours won by their comrades for the Party through sacrifice and hard work. Individualism frequently expresses itself in unprincipled discussions and disputes, factional struggles and in sectarian tendencies and in undermining Party discipline. A closely related mistake is that of departmentalism, in which a comrade sees only partial interests, sees only his part of the work instead of seeing the situation as a whole and of the work of others. It often leads to obstruction and must be avoided. The first consideration of people with such ideas is their position in the Party. They like to show off, and want others to flatter them and admire them. They have a personal ambition to become leaders. They take advantage of their abilities and like to claim credit; to show off themselves; to keep everything in their hands and they are intolerant. They are full of vanity, do not want to keep their heads in hard work and are unwilling to do technical work. They are haughty. When they have made some small achievements they become very arrogant and domineering as if there were no one else like them in the world. They seek to overshadow others and cannot treat others on equal terms, modestly and politely. They are self conceited and like to lecture others, to instruct and boss others. They are always trying to climb above others, and do not accept directions from others, do not learn modestly from others and …….. from the masses, nor do they accept criticism from others. They like to be “promoted” but cannot stand being “demoted”. “They can only work in fair weather but not in foul. They cannot bear attacks on injustices and are unable to adapt themselves to circumstances. They are no great men capable of asserting themselves when necessary or of keeping in the background when required. They have not yet got rid of their deep-rooted “desire for fame” and they try to build themselves up into “great men” and “heroes” in the Communist cause, and even have no scruples in employing any means for the gratification of such desires. However, when their aims cannot be achieved, when they …….. treatment from comrades in the Party, there is a possible danger of their wavering. In the minds of such persons there exists remnants of the ideology of the exploiting classes. They do not understand the greatness of Communism, nor do they have the broad vision of a Communist. A Communist should have none of these shortcomings. Whoever possesses such weaknesses does not understand Communism and cannot rise to become as great as Lenin. In the Communist Party leaders achieve success through mass support. Mass support is earned by those Party members who have no personal interests as against those of the working class and the Party who are completely loyal to the Party, who have a high degree of Communist ethics and revolutionary qualities, who strive to master the theory and methods of Marxism-Leninism, who have considerable practical ability, who can actually direct Party work, who are not afraid of serious study and love work, and who become heroes and leaders in the Communist revolution because of the confidence and support they enjoy from the masses of the people. The struggle to change the …….. world into a Communist world cannot be carried out by one person however able he may be and however hard he works. It can be carried out successfully only by the planned and combined efforts of millions of people. Some Party members are contemptuous of technical work within the Party. Such an attitude is incorrect because technical work forms an important part of Party work and because a Party member should be ready and willing to do any work which is important to the Party whether or no(t) he likes to do such work. (iv) Other comrades within the Party reflect the ideology of the exploiting classes. In their Party work and in their relations with other Party members they behave like landlords, capitalists, and fascists. These persons seek to develop themselves by holding down others. They are jealous of those who are more capable. They are not prepared to work under other comrades or to take instructions. They secretly rejoice when other comrades fail in their political tasks and in their moral standards and conduct. They indulge in gossip and spread false information about their comrades. These are the characteristics of exploiting classes and are …….. the working class and the Party. They should be fought and exposed wherever they are found. The working class is entirely different from the exploiting class. It does not exploit others nor does its interests conflict with those of the Party and other workers of exploited masses. The outlook and thinking of the working class are altogether different from those of the exploiting classes. In dealing with the enemies of the people they are merciless and uncompromising, but in dealing with their comrades they are always inspired by love and the desire to assist. They are strict with themselves but lenient towards other comrades. They are strict and firm on matters of principle and always adopt a frank and serious attitude. This is the outlook of the working class and should be learnt and developed by every Party member. (v) Some comrades still have bureaucratic tendencies. They like to run the Party by issuing edicts and directives without …….. without taking into account the views of other comrades. They resent criticism and are very harsh in dealing with other comrades. Such weaknesses are unmarxist and every communist should strive to overcome them completely. Furthermore a Party member should be broad minded and concern himself always with the overall situation when dealing with problems. He should avoid pettiness and unprincipled discussion. He should have …….. standpoint and not a fence sitter. Although the Communist Party is the most progressive of all political parties, and although it fights for a society which guarantees happiness and prosperity to millions of people, not everything in it is perfect. In spite of the fact that its members are the world’s most conscious and progressive revolutionaries with the highest sense of morality and righteousness, there are still defects in the Party and some of its members do not measure up to the qualifications of a Communist revolutionary. The explanation for this state of affairs lies in the fact that every Communist Party member emerges out of the very society whose evils it seeks to remove. Its members come from the various classes of that society and some of them bring into the Party the habits, prejudices and outlook on life of the class from which they came. It is precisely for this reason that Communist Party members must undertake self-cultivation. In addition to waging struggles against counter-revolutionary forces, the Party must carry on inner-Party struggles against those comrades who are still influenced by the outlook and prejudices of the exploiting classes. (i) The first group is composed of those who completely severed their ties with the capitalist class years ago. This is the core of the working class and are the most loyal and reliable. (ii) The second group consists of those who only recently came from the non-working class, who came from the …….. the middle class and the …….. They are usually anarchistic and ultra-left. (iii) The third group is composed of the working class aristocracy, those working class members who are best provided for, who earn high wages and whose economic position is comparatively high. They compromise easily with the enemies of the people, with the capitalist class. Every Party member should aim to be the most loyal and reliable to the cause of Communism and to have a firm and clear-cut working class outlook. 8. THE ATTITUDE TOWARDS VARIOUS ERRONEOUS IDEOLOGIES IN THE PARTY AND INNER PARTY STRUGGLE. Some Party members have a pessimistic view on things and they see errors, defects and a future beset with formidable difficulties and dangers. The growing strength of the socialist camp, the power influence exerted by our Party in our own country and the certainty of the final victory of Communism over Capitalism inspire them with no hope in the future. Others see only victory and progress, and fail altogether to notice defects and errors in the Party. They become dizzy with success, become blindly optimistic and become less vigilant. Both views are un-marxist. A Communist Party member knows that the Communist Party is the most progressive and most revolutionary Party in the world. He has complete confidence in the future and he dedicates his entire career to the cause of Communism. In spite of this knowledge he realises most clearly that in our Party there are still various kinds of errors, defects and undesirable things. A Party member clearly understands the origin of these errors and the method to be used in removing them. (i) To enjoy seeing errors and defects in the Party and to magnify them to undermine the Party. This is the attitude of spies and similar elements within the Party. (ii) Some people consider that the existence of errors and defects in the Party is to their advantage and they deliberately help to spread them and to make use of them. This is the attitude adopted by opportunists and similar elements within the Party. (iii) To leave these errors and defects undisturbed instead of fighting against them. This is the course followed by those members who have but a weak sense of duty towards the Party and who have bureaucratic tendencies. (iv) To harbour violent hatred towards errors and defects and towards Party members whose political outlook is incorrect. They believe in bitter struggles among Party members and expel their comrades at the slightest pretext. This is the method used by Party comrades who do not correctly understand the methods of correcting mistakes and weakness amongst comrades. (i) We first analyse the situation most thoroughly and decide which views are correct and which of them are incorrect and dangerous to the Party. Once we are convinced of the correct opinion we firmly uphold it to the bitter end and no matter how strong the opposition and how influential the individuals who hold the opposite point of view. (ii) Having carefully analysed the situation and having decided which is the correct opinion, we then devote our attention to the promotion and development of the correct viewpoint. We never allow ourselves to be influenced by an incorrect point of view. (iii) Communists are men of action. In promoting and developing the correct viewpoint we also fight actively against all the undesirable things in life. A Party member who is afraid of action and hard struggle, however brilliant he might be, can never be a Communist revolutionary. A Communist must always and under all circumstances, be ready and willing to conduct an active struggle against all forms of reaction. (iv) Although a Communist never compromises on questions of principle, he never adopts an inflexible and mechanical attitude in his methods of struggle. The aim is always to reform and educate those comrades who still possess non-Communist tendencies. (v) The elimination of undesirable tendencies in the Party and the building up of revolutionary qualities in our members enhances the discipline and prestige of the Party. Those Party members who fail to respond to the most patient persuasion and to efforts to educate and reform them, should be expelled from the Party. (i) Is a member of the Communist Party who is absolutely faithful and loyal to the Party, who obeys without question all Party rules and regulations and who carries out all instructions issued by the Party. (ii) Has thoroughly studied the works of Marx, Engels, Lenin and Stalin, who understands them clearly and who knows how to carry out their teachings in the struggles of the people to defeat capitalism and all forms of exploitation. (iii) Devotes all his time to one thing, and one thing only, the struggle against Capitalism and for a Communist world. (iv) In their relations with Party comrades are always inspired by love and sincere friendship and the desire to be helpful. (v) Are honest and upright and who are prepared to defend the truth at all times and under all circumstances. Such is a good Communist. Dialectical Materialism is the revolutionary philosophy of the Communist Party and the working class. Dialectical Materialism was founded by Marx and Engels and is discussed and explained in the works of Lenin and other prominent leaders of the Communist Movement. It is a dialectical philosophy because it studies things concretely and objectively and because its approach on all things in nature is always based on data established through scientific investigation and experience. It is materialistic because it holds the view that the world is by its very nature material and that the numerous things and processes we see in the world constitute different forms of matter in motion. In ancient times dialectics was the art of arriving at the truth by disclosing the contradictions in the argument of an opponent and solving these contradictions. This dialectical method of establishing truth was later extended to the study of nature. Using the dialectical method of study and investigation, mankind discovered that all things in nature are always in motion and always changing, and that nature develops as the result of contradictions in nature itself. (1) The dialectical method considers that nothing can be understood taken by itself in isolation from other things or from its surrounding circumstances. A thing must always be studied and understood in relation to its environment or circumstances. (2) The dialectical method considers everything as in a state of continuous movement and change, of renewal and development, where something is always arising and developing and something always falls into pieces or is dying away. (3) The dialectical method holds that the process of development should be understood as an onward and upward movement, as a transition from an old qualitative state to a new qualitative state, as a development from the simple to the complex, from the lower to the higher. (4) The dialectical method holds that internal contradictions are inherent in all things in nature. Everything has its positive and negative side, a past and future. In nature there is always something dying away and something developing. The struggle between the opposites, between the positive and the negative, between the past and the future, between the old and the new, between that which is dying away and that which is being born, is the sole reason for development and change. Historical materialism is the application of the principles of dialectical materialism to the study of society and its history. A Communist must strive to master completely the principles of the dialectical method discussed above and use them as a guide in his political work. Dealing with the first proposition mentioned above, the principle of considering things in relation to actual conditions and circumstances and not apart from these actual circumstances, is always of vital importance to a Communist in deciding the simplest policy questions. A Communist is useless to our movement if he deals with policy questions in the abstract without taking into account the actual circumstances in relation to which policy has to be implemented, without understanding that the same policy can be right in one case and wrong in another depending on the concrete circumstances of each case. In their struggle against race discrimination the oppressed people of South Africa have in the past followed a policy of peace and non-violence. They still seek peaceful solutions and they will do everything in their power to avoid violent strife and bloody revolution. But a blind and mechanical application of this policy, irrespective of actual conditions and circumstances can lead to defeat and disaster for our movement. In the past the people were able to conduct successful non-violent struggles because opportunities were available for peaceful agitation and struggle. But the policy of the Nationalist Government, which forcibly suppresses the peaceful struggles of the people, has created new conditions under which non-violent and peaceful methods of struggle have become inadequate to advance the struggle of the people and to defend their rights. Under these new conditions it is easy to understand why the masses of the people are searching for a new formula of political struggle which will enable them to hit back effectively and end the violent and reactionary policies of the Government. Whilst in the past it was correct to preach non-violence, under present conditions it is not correct to go on stressing it as if nothing has changed. There is nothing sacred or inherently superior about non-violent methods of struggle. So long as they are effective weapons to fight for freedom and democracy, they must be employed fully, but it would be wrong to persist with them mechanically once conditions demand modifications. The second proposition is equally important. If the world is in a state of constant movement and development, if the dying away of the old and the upgrowth of the new is a law of development, then it follows that no system of society is permanent and everlasting. Just as primitive communal society was replaced by slave society, and just as slave society was replaced by feudalism, and feudalism by capitalism, so will capitalism be replaced by socialism. This is what happened for instance, in Albania, Bulgaria, China, Czechoslovakia, East Germany, Hungary, North Korea, Rumania, Russia and North Vietnam. In all these countries the capitalist system was overthrown and replaced by socialism. In our own country capitalism cannot and will not last indefinitely. The people of South Africa, led by the S.A.C.P. will destroy capitalist society and build in its place socialism where there will be no exploitation of man by man, and where there will be no rich and poor, no unemployment, starvation, disease and ignorance. According to the third proposition of dialectical method, the process of development should be understood as an onward and upward movement, as a transition from the lower to the higher and from the simple to the complex. Hence the transition from capitalism to socialism and the liberation of the working class from the yoke cannot be effected by slow changes or by reforms as reactionaries and liberals often advise, but by revolution. One therefore, must be a revolutionary and not a reformist. Finally, if development and change in things take place by way of collision between opposite forces, then it is clear that the struggle between workers and capitalists is natural and unavoidable. Hence we must not try to preach peace and harmony between workers and capitalists. We must stimulate and encourage class struggle. We must call upon workers to conduct a ceaseless war against the capitalist class and for socialism. The philosophy of materialism as expounded by Marx is a way of explaining all questions, and is irreconcilably opposed to idealism. Two examples are given to illustrate the difference between the two methods of materialism and idealism, namely, what causes thunderstorms and why are some people rich and others poor? An idealist would answer by saying that thunderstorms are due to the anger of God and that some people are rich and others poor because God made them so. The materialist, on the other hand seeks for an explanation of the natural forces and in the material and economic conditions of normal life. To a materialist, thunderstorms are due solely to natural forces and not to the anger of the Gods. He would explain that some people are poor because they are compelled by material conditions to work for low wages for the rest of their lives for the rich who own the means of production - the land, its mineral resources and its forests, the banks, mills and factories, transport and other systems of communication. These differences have important practical results. If we accept the idealist’s explanation of thunderstorms, and of why some people are rich whilst others are poor, then there is nothing we can do about the matter except to sit, arms folded and pray to God. If we accept the materialist’s explanation, however, we will take precautions against thunderstorms such as building lightning conductors. Instead of accepting our poverty as the will of God, we will stand up and fight to put an end to a system of society which condemns us to lifelong poverty and misery. (1) That the world is by its very nature material. In other words the things we see in the world are composed of matter. (2) That matter is something we can see with our naked eyes or by the aid of scientific instruments. (3) That the world and its laws are capable of being known. That although there are things which are not yet known, such things will yet be known through scientific investigation and experience. Idealism is essentially a belief in superstition, in the mysterious. It goes hand in hand with religion. It prevents clear thinking and confuses people. For ages it has been used by the exploiting classes to prevent the common people from thinking for themselves. It is a philosophy of the ruling classes and not of the working class. It is not the philosophy of people who fight for freedom. The philosophy of the working class is dialectical materialism, the only philosophy which is based on truth, and which is scientific and practical. Political economy explains how men get their living. It deals with the production and distribution among human beings of food, clothing, shelter, fuel and other things essential to human life. An important feature about production is that it is always in a state of change and development. Furthermore changes in the mode of production inevitably result in changes in the whole system of society, in the ideas of that society, in its political views and in its political institutions. To put it simply, at different stages of development people lead a different sort of life. Five main modes of production and five main types of society are known to history. These are primitive communal society, slave society, feudal society, capitalist society and socialist society. Under primitive communal society, men of the village went out together to hunt for the animals, to fish and gather the fruit that grew wild. The land and forests in which they hunted and picked up wild fruits, the rivers in which they fished, belonged to the whole community and not to any particular individual property and was shared equally by all. For clothes they used the skins of the animals they killed, and for shelter they used caves and rocks. Their tools consisted mainly of a hunting spear and trap and of a fishing net. This is how man produced food and shelter under primitive communal society. There were no classes. There were no rich or poor, no exploitation of man by man, and all were equal before the law. The affairs of the village were discussed publicly in a village council and all members of that community could attend the meetings and take part fully in the discussions. In times of war they killed their prisoners. They could not enslave or exploit them because they had no food to feed them with. In those days man could only produce enough food to feed himself and could not afford slaves. The only division of labour that existed was between the sexes. The men hunted wild animals and gathered wild fruits whilst the women managed the house, looked after children and cooked the food. This is the sort of life man led during primitive communal ........ the earliest mode of production known in history. In course of time some tribes developed new means of producing food and this change in the method of producing food enabled men to lead a different sort of life. They began to sow seed and rear cattle so that they should have food ready at hand whenever they wanted it. Primitive agriculture began to develop and there arose differentiation between the tribes. Some still concentrated on hunting as the principal method of producing food, but others became pastoral farmers. The latter could now produce more than required for their personal needs. They became rich in cattle and began accumulating wealth. Under these new conditions men captured in war were not killed as in former days. Now they were needed to plough the lands of their captors, to look after their wealth and to produce more wealth for the slave owners. The division of society into classes had begun. The land and forests in which men used to hunt in former times, and the rivers in which they fished no longer belonged to the whole community but to the slave owners. The common and free labour of all members of the tribe in the production process, which existed under primitive communal society, had now disappeared; in its place there was now the forced labour of the slaves who were exploited by their masters. There was no common ownership of the means of production or of the fruits of production. Common ownership was replaced by private ownership. Rich and poor, exploiters and exploited, people with full rights and people without rights, and a fierce class struggle - such were the conditions under slave society. The emergence of private property, of contrasting extremes of enormous wealth on one side and dire poverty on the other, and the class hostility that resulted, made it necessary for the slave owners to build an instrument which they could use to protect their properties and their wealth and to crush slave revolts by force. It was under these circumstances that the exploiting classes created the army, the police force, the courts and the prisons and made laws. These things put together are called the State which is an instrument used by the exploiting classes to compel others to give in to their will. The State will last as long as class society exists. Only under Communism will the State disappear. In primitive communal society, order and discipline were maintained by tradition and custom and by force of public opinion. It was not necessary to rely on an instrument of force to suppress others. In exactly the same way, under Communism there will be no State because mankind will have reached a high level of political and cultural development and responsibility. A significant development during slave society was the emergence of commodity production. Articles produced not for the personal use of the producer, but for exchange, are called commodities. This was a development of tremendous importance and we will discuss it very fully when we deal with capitalist society. This was then the mode of primitive life under slave society. The system of society had changed, the people led a different way of life, new political ideas and new political institutions had arisen. Feudal society developed out of slave society and was essentially an agricultural mode of production. There were two main classes in feudal society. These were the Lords and the Serfs. As in slave society, the means of production were owned by the lord of the estate. The serf was in a slightly better position than the slave because the lord did not have the power of life and death over him, and also because the serf owned the tools he used to plough the lands of his lord. He was however, subject to cruel exploitation and restrictions. He ploughed the land of his lord in return for a piece of land which he was allowed to occupy at the pleasure of his lord, and out of which he maintained himself and his family. The piece of ground where he lived was given to him to encourage him to produce more food and more articles for the enrichment of his lord, and he thus produced better results than the slave. He was tied down to the land and could not leave without permission. He was in a similar position to our own squatters commonly found on many white farms in our country. Under feudal society, food was grown and clothes and other articles were made to cater for the local population but the lords (or nobles as they were commonly referred to) used part of their wealth to buy all sorts of luxuries for themselves. In the course of time trade and transport developed and the desire for more wealth and luxuries increased. The development of trade and transport led to the growth of towns and their influence. It gave rise to new classes of society and to new ideas. A new class of men who earned their living through trade and commerce arose. These were the merchants. Feudal society became an obstruction to the expansion and growth of trade and commerce and the new ideas that were arising. The new class that was rising to power came into conflict with that class that held power. Feudal society was being challenged by the new social system of capitalism. Only by revolution could the new forces that were arising be freed. It was by revolution that the new forces challenged feudal society and replaced it with capitalism. It was also by revolution that the working class in many parts of the world replaced capitalism with the higher and democratic system of socialism. We have now seen that five main types of society are known to history. Primitive Communal Society, Slave Society, Feudalism and Socialism. New forms of society grew out gradually from the other society and in some cases different forms existed side by side. For example, in slave society there were traces of primitive communal society, whilst traces of slave society existed within feudal society. In our own capitalist South Africa there are still Africans, and to a lesser extent Coloureds, who live and work on white farms under conditions remarkably similar to those of feudal society of the Middle Ages. In other parts of the world we see Socialist societies, and societies in transition to Socialism. We live in a capitalist country and the chief task of our Party is to destroy Capitalism and replace it with Socialism. Capitalism is to us a …….. of …….. great imbalance. It is for this reason that we devote the greater part of this lecture to a study of this system. Capitalism has three essential features. (1) Wealth is concentrated in the hands of a few people who own the means of production as well as wealth in the form of money. The few people who own the means of production are called capitalists. (2) The vast masses of the people earn their living by working for capitalists in return for wages. In Marxist language these working people are called the proletariat. 1. Karl Marx (1818-83), German revolutionist, cofounder with Friedrich Engels of modern communism. Suggested that the capitalist society should be overthrown by the working class. His theory of scientific socialism is now called Marxism. 2. Friedrich Engels (1820-95) Co-founder of communism with Karl Marx. Exercised considerable influence in the shaping of communist policy and principles. 3. Vladimir Ilich Lenin, original surname Ulyanov (1870-1924), Russian Marxist revolutionary and theoretician, and founder of the Soviet state (1917). 4. Joseph Stalin, real name Yosif Vissarionovitch Djugashvili (1879-1953), Russian Revolutionist and Soviet dictator. He established a terroristic police state in which millions of his own citizens were murdered.